If you’ve been athletic all your life, you know what it’s like to suddenly find yourself struggling with plantar fasciitis. Pain starts to be a constant, every time you try to participate in your favorite sport or exercise. You may even be tempted to give up running or tennis, just because you’re tired of the pain that seems to be always present. The thing is that you could need new tennis shoes. There are some great plantar fasciitis tennis shoes that will make all the difference and ensure that you can keep living your active lifestyle. Those with plantar fasciitis usually get it from being on their feet a lot or from practicing a high impact sport. If you are someone who has haphazardly bought shoes for running or tennis, you may need to pay more attention to the kind of support your shoes are providing. It’s easy to simply grab the best-looking pair off the shelf, but when you’re living with pain, this may not be an option. Before you start thinking that you’ll have to start wearing ugly, medical looking tennis, rest assured there are plenty of stylish options. Just because you will be wearing recommended shoes for plantar fasciitis, you don’t have to worry about giving up your favorite brands. From Nike to ASICS, there is something for every style. Remember that comfort is just as important as your aesthetics, so shop wisely. While you certainly want to focus on the fit and benefits over fashion, don’t worry, there are some trendy options. You can keep up with your style in activewear yet be able to enjoy painless running. The following reviews will help you have a better idea of what to look for and give you an idea of the features that matter the most. Nike has a shoe that is great for you if you suffer from plantar fasciitis. The women’s Zoom Vapor has a classic design that is chic and simple yet it’s features are even more attractive. To provide the comfort you need while exercising with plantar fasciitis, the herringbone outsole pattern and thick tread ensures that you get support and amazing traction. Because it has thick tread in high wear parts of your foot, it can keep your feet protected in your active lifestyle. The TPU frame and midfoot shank also ensures extra stability, which is highly important for those have pain while running. With a unique Dynamic Fit system, the midfoot, arch area is protected during your run. The XDR compound in the heel and forefoot area means that your shoe should stay durable throughout the year. They also have excellent grip, so they’ll work wonderfully for tennis or running on concrete. As sturdy as they are, they feel lightweight to wear. They are a highly comfortable pair of shoes to wear for anyone, but especially for individuals with arch problems or plantar fasciitis. If you’re a Nike aficionado, these shoes may be right up your alley. These eye-catching adidas don’t only catch your attention for their looks, but they also have some great features for optimal functionality. On the surface, these shoes have a great exterior. With textile, synthetic material, they are durable. They also have a rubber sole that will last through months of use and will help to keep you safe while you’re playing a high impact sport. These adidas have a fabulous Adiprene+ insert that is helpful for sports that require propulsion and stability in the game. The Adiwar 6 outsole helps to keep them in top-shape, but also adds some protection for runners with plantar fasciitis. They are lightweight and comfortable to wear for long periods of time. If you are looking for a pair of shoes that will comfortable the first time that you put them on, these don’t require you to break them in. If you like bright colors and want a stylish pair of adidas, these are a pair that you can trust for pain-free use. They aren’t that costly and will provide you with the durability you need for your sport or favorite form of exercise. Also, they won’t weigh you down, making them perfect for tennis. It’s all about the soles when it comes to the support you need for your issues. If you are tired of trying to run or play sports with pain, these K-SWISS may be all that’s missing for your comfort. With a rubber sole, a molded-foam insole, K-EVA midsole, and solid rubber outsole, these babies are the king of soles. Besides all the fabulous comfort provided by the soles on the K-Swiss, there are other factors that make these comfortable. The plush tongue and collar help you to have comfort from ankle to toe when wearing these beauties. The leather upper with a reinforced toe screams durability. Their dark color means that they won’t look dirty too quickly. If you’re someone who has plantar fasciitis, you won’t have to worry about fussing with insoles for comfort. For people who can be particular about the whole construction of their shoes, you’ll appreciate that even the tongue is designed for your comfort. If you need the best tennis shoes for plantar fasciitis, these are definitely ones that you’ll want to consider. They are offered at a fair price and will provide you with months of comfortable wear. Made from synthetic and mesh, the Prince tennis shoes are breathable and comfortable. With a rubber sole, they will last for a long time to come. The shock eraser cushioning is what any runner would want for comfortable, long periods of use. And, the wYshbone shank means that you’ll have more stability than ever. If you run on concrete or play tennis, these shoes provide you with the perfect traction with PRC 1000 rubber. The RASH toe cap ensures durability and provides protection, as well. Beyond the comfortable features on these Prince shoes, they are also a highly-attractive pair. With a unique design that is both original and trendy, if you want a good-looking pair of shoes that will feel amazing while playing, these are them. With their supportive features, the Prince shoes may be considered a bit too heavy for some. If you happen to have weak ankles, the Prince shoes offer support in the ankle area. If you’re about style as much as function, these are a great pair to consider. They have a sleek, attractive design that will look good for any type of use. Beyond their trendy looks, these adidas are also ideal for those with issues with their feet. For example, the measurement from arch to shaft is Low-Top, which helps to provide you with the support you need. They also have textile/synthetic materials which make them breathable for the warmer months or for hours of use. With a rubber sole, you can trust that they are durable and dependable. Because those with plantar fasciitis need full-foot support, you’ll appreciate that these shoes offer a comfortable, supportive fit for the whole foot. You’ll also like these adidas if you like a smooth, snug fit that doesn’t allow your foot to slide around. If you play a fast-paced sport, you want your shoes to fit like a glove. With extra rubber in problem areas, these adidas can provide runners with the support they need. They are also cushioned around the ankle area, so everything from your ankles to toes is protected. From their looks to their comfort, it’s hard to find a shoe that can beat these beauties. These ASICS shoes for plantar fasciitis may not be the most stylish pair of shoes, but they offer great support. The rear foot and forefoot GEL cushioning ensures that your shoe bears the brunt of impact. This helps you to not only transition quickly and easily, but also keep your feet comfortable while playing or running. The PGuard Toe Protector keeps your toes safe and also provides added support. Because tennis shoes tend to wear around the toe area quicker than others, you want a strong toe. Especially in a sport that requires you to transition your feet continuously. With gender-specific cushioning, these ASICS are stable and comfortable to wear. They also have a rubber sole that helps them to remain durable and in good condition for months to come. Available in several different colors, you can choose the color that best suits you. These Wilson’s are attractive and stylish, but they are also some of the most comfortable tennis shoes that you can find. If you play tennis, you’ll appreciate the features on this pair. With a grippy Rush Pro 2.0, you can do foot transitions comfortably while playing a match. The mesh, synthetic material promises breathability, even after a long period of time using them. You’ll also appreciate the traction on these Wilson shoes if you play tennis. If support is extremely important to you, then you’ll love these Wilson tennis shoes for their incredible 3D-F.S. injection molded TPU forefoot feature. The Endofit elastic mesh is a unique feature. It allows you to get a better, more intuitive fit. Of course, tennis players will love the Pro Torque Chassis arch technology. This means that you will have all the stability you need for the love of the game. As any tennis player knows, your shoe needs to be sturdy but flexible at the same time. These beauties won’t disappoint. They have great responsiveness that allows you to move around effortlessly. As supportive as these shoes are, they aren’t too heavy and will provide you with comfortable use. These New Balance shoes may have a “dad-shoe” vibe, but the support they give you will make you forget about style. With leather and synthetic material, they are both breathable and durable. The rubber sole means that you’ll be able to wear these babies for a long time to come. The sole thickness also helps to keep your feet safe from heavy impact. With ABZORB cushioning, running doesn’t have to be painful when you wear these shoes. This feature ensures that the shoe absorbs impact, not your feet. The C-CAP midsole also helps provide the support that those with plantar fasciitis need. These shoes also provide the stability that you may need for tennis matches. They also have a unique lightning dry liner. They are designed with wider space than most, which make them perfect for those with bigger feet. They have thicker cushioning and insoles than some other options. If you want to make sure that your feet are completely comfortable, these are the ones you want. Priced reasonably, these babies are ideal for anyone with wide feet who wants the support that their feet are begging for. If you’re a woman who is looking for that support you deserve, these K-Swiss are idea. With an abundance of top features, these may be what you’ve been looking for. They have a special Heel Grip Lining that keeps your socks on without slipping (who has time for that?). They also boast of special laces that won’t untie easily. But, if you’re here because of your plantar fasciitis, you probably want to know about support. You want it? These pink beauties have it. With a GuideGlide midsole, you can be sure that your foot will be cradled just right. The 180 PSC Plantar Support Chassis ensures mid-foot stability, so you don’t have to worry about pain. With a DragGuard TM outsole, the toe and heel area get the protection you want. The AOSTA 7.0 high-density outsole means that these shoes are as durable as they are comfortable. Last but not least, the K-EVA formula means that you get that cushioning you want in the midsole. If you’ve been looking for a girly, fun, and most of all, sturdy shoe, these may be the ones for you. They are the queen of support when it comes to women’s shoe. If you’ve been suffering in silence in regards to plantar fasciitis, you can say goodbye to pain and hello to comfort with these K-Swiss beauties. Another supportive shoe from ASICS, these are not the fanciest pair, but they will be a comfortable pair. With a PGuard toe bumper, you don’t have to worry about injuring your toes in a match. They also boast of a Flexion Fit construction which makes them sturdy and reliable. The gel and Solyte midsole help to keep the impact of your movements away from your feet. The strong and durable AHAR Plus outsole provides support. If you have high arches, these shoes will offer you that great arch support that you’re looking for. It also means that you’ll be able to use these shoes for a long time to come. Made from synthetic material, they allow a reasonable level of breathability. They aren’t as long-lasting as some other options and definitely aren’t beautiful, but they are a relatively reliable shoe for people with plantar problems. They also don’t include as many features as you would want for the price, but if you’re looking for a relatively supportive shoe, they could work. With so many shoes to choose from, how do you pick just one. If you have plantar fasciitis but want to keep up with your sport, you want to get it right. After all, it can make all the difference between you being able to exercise or not. If you have a favorite sport, it can be a pain to play with pain, so choosing well is key. Each one of the shoes above, whether for women or men, promises that you will have special features in the areas that are typically problem points. This means that whichever one you go for, you can be sure that it promises support. The following features are some of the most important ones to pay attention to while shopping for your new pair of tennis shoes for plantar fasciitis. Each individual has their specific needs, so pay attention to your feet and research what will work best for you. Where does it hurt when you try to run or play tennis? Plantar fasciitis may be wreaking havoc on your heel and you’re finding it difficult to enjoy activities that you used to have no problem participating in. It can also cause pain along your arches, which is why it’s important to have complete heel-to-toe support in your shoes. When shopping for your new tennis shoes, look for descriptions that promise support and comfort from heel to toe. This can be done in different way, whether in the midsoles or other types of design technology that ensure maximum comfort and support. If you’re a tennis player, you will find that you want stability in your shoe for added comfort while on the court. Keep an eye out for shoes that promise heel stabilizing effects. These can make a world of difference in your life and keep you from feeling the pain of plantar fasciitis. Cushioning is an important component of tennis shoes for people with plantar fasciitis. The wrong kind of cushioning could send you home with more pain than ever, so it’s important to pay attention to the cushion. Cushioning in the midsole can help, as does cushioning around the heel and ankle. It can help to protect your feet from high-impact and thus also keep them safe from pain. 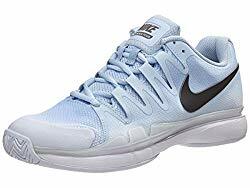 Shoes with gel cushioning in the forefoot and rear foot are a definite favorite amongst tennis players with plantar fasciitis. Cushioning also helps to attenuate the shock and helps to keep your feet from injury. While the functionality of your shoe is highly important, you want to pay attention to the design. While the aesthetics of the design are important for the fashionista, you want to notice the construction. Construction is key, as a shoe that is known to be narrow may be one you want to ignore, if you know that you need toe room. It may look beautiful, but if it doesn’t feel good, then what’s the use? Does the heel have a nice thick tread to keep you from feeling the ground? Do they have the ankle cushion and support that will keep your feet stable, no matter your foot transitions? Check out the outer design and see if it will work for you and your needs. If you have wide feet, it can be a tough world. It’s difficult to find options with a spacious toe area and that aren’t so narrow. If you have plantar fasciitis and wide feet, it can be challenging to find the perfect shoe. But, it isn’t impossible. The fit of your shoe is just as important as the support. You may find a super-cushioned shoe, but if you don’t find the right fit around the toe and heel area, it can end up in causing you other problems. It may take you a while but finding the right fit will make a world of difference. It will help you to stop having so much pain and also keep you doing what you love. Your tennis match may take a while and you want to be comfortable the whole way through, right? To avoid having to buy insoles for your shoes, it’s ideal to find shoes that already have great soles. From the midsole to the outsole, the construction of your shoe matters. Durable, rubber, outsoles will ensure that your shoes last a long time and that they are supportive. You want soles that are going to absorb the shock from the impact of running or playing tennis. Look for tennis shoes that have some kind of advanced and supportive technology in the soles, both inner and outer. As you can see from the above list, there is something for every gender and style. Whether you’re a big fan of Nikes or you just want to find a supportive pair, there are shoes for every style—and plantar fasciitis. The Nike Zoom Vapors are a favorite, because they provide both light flexibility for the game but great support for your pain. The Wilson shoes are an all-time favorite for the plantar fasciitis sufferer who wants to keep up with their game. Their support and stability mean you can keep up with your foot transitions without worrying about a thing. The K-Swiss pair of shoes for women have almost any feature you could ever want when it comes to support. They will make you wonder how you ever played without them. They’re also some of the most adorable shoes around for ladies. That is, if you like pink and camo. If you want to go with a better priced option, the New Balance pair are affordable and still offer top support. When it comes down to it, any of the shoes mentioned above will give you great support to keep you active. There are different strokes for different folks and we hope this list has given you an idea of what you want. Many a person will give up the game when they discover they have heel issues or arch pain. This is a big mistake. It’s all about the shoe. It’s why it’s so important to take your time when shopping for tennis shoes. You want to keep playing and you should be able to, so don’t give up and find the shoe that will work for you. You can’t let the idea of plantar fasciitis keep you from enjoying what you love. There is a shoe that will fit you like a glove (and that’s what you want) and will ensure that you can enjoy painless games and exercise. Happy playing!